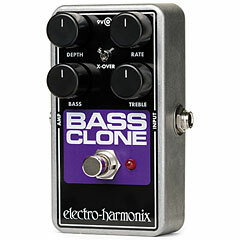 The Small Clone Chorus is one of the most famous classics in the Electro Harmonix program. The Bass Clone Chorus also offers an optimised bass version. With the crossover switch the low frequencies in the modulated signal can be switched off, the dry signal remains unaffected, so that a pressureful sounding bass is always maintained. The treble control acts on the effect and the dry signal, the bass pot acts only on the unmodulated direct signal to support the low bass fundament when needed. The whole device is in a space-saving nanocontainer. Electro Harmonix has a heart for overloaded Pedalboards, The Nano series pedals are housed in space-saving pedal boxes in standard size, so that even the usually huge Big Muff can be easily accommodated.